Ken Logan » Bird Photography » Welcome to my website! If you are interested in birds from all seven continents, then enjoy the opportunity to view more than 3700 species I have photographed over the past 10 years. 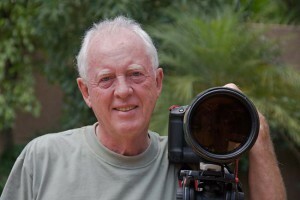 My name is Ken Logan and my number one hobby in retirement is birding and bird photography. I am however still a birder first and a photographer second. Having seen most of the birds of Southern Africa (Southern African list 883) I decided a fun retirement project would be now to try to photograph them. Ten years after holding an SLR camera and lens in my hand for the very first time at the age of 63 I have now photographed over 880 birds on the Southern African list and 3700 world wide. My wife Stephanie and I bird overseas two or three times a year. Joining overseas birding companies on their trips dictates the sort of photography I do. These days I carry two bodies (a 1d mark 1v and 1DX) and two lenses – a 400 mm F4 and a 70-200mm f2.8 plus converters with me overseas. My 500mm F4 I leave at home and use from the car or occasionally from a hide.So the majority of my photography is done using the 400 mm lens which is my constant companion slung from my shoulder for up to 12 hours a day. Bird photography is a challenge.The light conditions in the tropical forests where the majority of the world’s birds live invariably mean slow shutter speeds and high ISO’s. Close unobstructed views are the exception not the rule. So a good sharp shot offers a lot of satisfaction. It is nice to think that some of your photographs have some artistic merit (I have had a few published in books and magazines) but the majority (shooting from the hip as I do) are record shots-some good, some average and many indifferent. The indifferent I have tried to discard wherever possible unless they are of a rare and difficult to photograph bird. Some of my early attempts from Antarctica using a 40D and a 100-400mm lens leave much to be desired but I hope you notice a real improvement in my later shots. I let you be the judge. Please don’t hesitate to comment on my site. I will try to post informative blogs and trip reports. Enjoy my trip reports- they tell it like it is and not the way the tour companies’ marketing information would have you believe.If you spot an incorrect ID or would like to suggest improvements I am always happy to listen and learn.